In recognition of November 11th, Remembrance Day, Veterans Day, or by any other name around the world. This journal is from WhitneySorrow.Etsy.com. 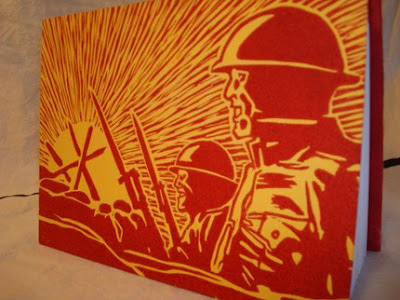 Cover image is an original, signed, lino print by her husband called "A New Day" inspired by old war comics. The journal is bound using an exposed Greek stitching. There is a mixture of papers, Japanese Chiri and Unryu, Nepalese Lotka, Thai Banana papers for the fly leaf and endpapers, and 96 pages of quality cotton rag paper. Thanks so much for the nod! This book is one of five featuring comic book style infantry images by my husband, Casey Sorrow. Check out my etsy shop, or my blog, Edgy Bibliopegy (www.edgybibliopegy.blogspot.com) to see the other four books in the series. The images themselves are original signed Artist's Proofs linocuts. Casey's father was in the service and Casey grew up reading every comic he could get his hands on, but he especially loved old war comics. His work is heavily influenced by these two things. I've bound them using a multi-needle across-the-spine Greek coptic method. They have 12 octavo signatures, a total of 96 pages of 32lb 25% cotton rag, with 30% post-consumer recycled content, with no watermark. The paper has enough texture that pencil and charcoal sketching is easy, and heavy enough that ink pens, including fine point sharpies do not bleed or show through. Thanks so much for featuring my bookbinding and my husband's art! And let's bring our men and women home safely.